The other shoe has dropped with the return of William Nylander to the active roster, as the Toronto Maple Leafs have traded Josh Leivo to the Vancouver Canucks in exchange for AHL winger Michael Carcone. Clearly, there was a handshake agreement in place between Kyle Dubas and Josh Leivo dictating that he would not be sitting games out in the press box while healthy and capable of contributing to a large number of teams in the NHL. 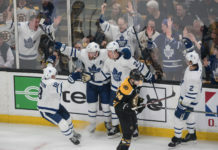 Leivo spent the better part of two seasons doing just that (sitting), hoping for Mike Babcock to take more of a shining to him while biding his time for an opportunity by way of injury or poor performance. The absence of William Nylander afforded Leivo that opportunity for the first time in his Leaf career to start the 2018-19 season, and for the most part, he took advantage of it. He posted four goals and six points in 24 games in limited fourth-line minutes playing primarily with Tyler Ennis and Frederik Gauthier, but more than the decent goal production, he brought a different element to the lineup as a skilled big body who could work the walls effectively. He contributed nicely to a fourth line that was a net positive when it came to possession and goal impacts. In an ideal world, the Leafs would’ve kept him around as a cheap, quality depth piece (and homegrown draft pick) who can fill in on the fourth line but could also jump into a top-nine role capably in a pinch. Roster and asset management wise, Leivo arguably offers significantly more value to the Leafs than Martin Marincin or Justin Holl — both extras on the active roster — currently do, but this is more about doing right by Leivo than either of those former considerations. How players are treated by an organization does matter, and Dubas clearly did what was right by a player who was a good soldier throughout his time as a Leaf, keeping his head down and working hard even when it seemed like the opportunity may never come for the better part of two seasons. The Leafs knowingly lost this trade, of that there is little doubt. Partly it’s down to how deep of a team they are down the right wing with the return of William Nylander, who is joined by Mitch Marner, Kasperi Kapanen and Connor Brown on one of the deepest — if not the deepest — right flanks in the NHL. There is a question worth asking about whether there was a better return available on Connor Brown (three goals, nine points in 27 games, but has scored 20 in the NHL) than this low sell on Leivo, but that was likely never in consideration knowing Brown’s significant penalty-killing contributions and the level of affection Babcock has for his professionalism and 200-foot game. In return, the Leafs acquired Michael Carcone, a 22-year-old right winger who has been plying his trade in the AHL for the Utica Comets. An undrafted signing out of junior by the Canucks organization, he put up two seasons of pedestrian AHL numbers but has broken out a little with 17 points in 20 games to start the 2018-19 season. The 5’10, 175-pound winger will add some scoring depth to the Marlies, which seems to have taken priority here over adding a mid-level pick for the draft coffers. Carcone was a breakthrough player in the QMJHL this season, jumping from 12 to 47 goals. The 19 year old had a stellar season with the Voltigeurs, finishing 2nd in the league in goals and 8th in points. The Whitby, Ontario native was in his 2nd season with the Voltigeurs. With Alex Barré-Boulet, he formed one of the top duos in the league. Carcone is a good skater with a good burst of speed and great agility, making him tough to contain for opposing defenders with his ability to make quick turns to avoid opponents. He’s a shooter first and has a good wrist shot that is very accurate, and he knows how to pick his corners. There’s a good, quick release on his shot and he can score from different locations in the offensive zone. On the power play, he can score in front or at the side of the net, even from the half-wall. His vision is underrated, as you always think goal scorer with Carcone but he sees the ice well enough to make quick decisions with the puck. He has good puck skills and is good in one-on-one confrontations; his quick agile hands handle the puck well. He’s not big and his size could be a problem at the next level, as he will need to add some strength. He struggled at the end of the season and lost his goal scoring title following a scoring drought in the last stretch of the year. He’s a bit of one-dimensional player, as he will need to score at the next level to achieve success. He could potentially play pro hockey next season, depending what happens with him at the draft, or he could sign as a free agent. But more than likely he should be back in Drummondville for his overage season.